I’ve been repurposing ceiling fan parts for the past 2 years or so and I’ve got quite a collection of projects using the material from the ceiling fans. 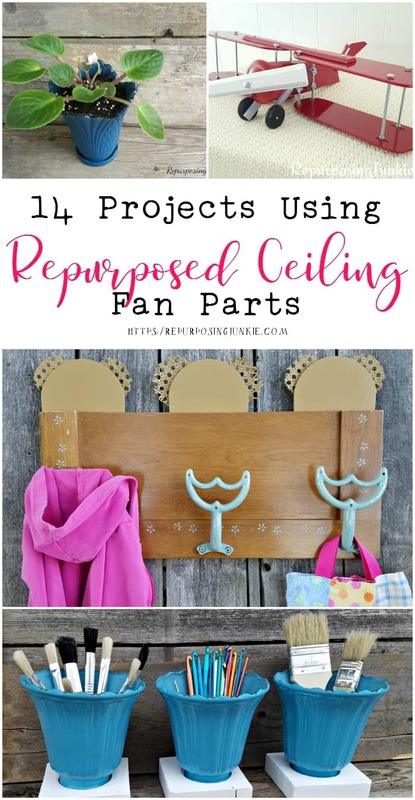 I’m sharing these 14 Projects Using Repurposed Ceiling Fan Parts with you and I hope enjoy them! You can click on the picture or the project title for more details. This coat rack uses both fan blades and the brackets from the blades. The “blue planter box” is actually a scrap piece of fan blade from another fan blade project. The chick on this sign is from a repurposed fan blade. 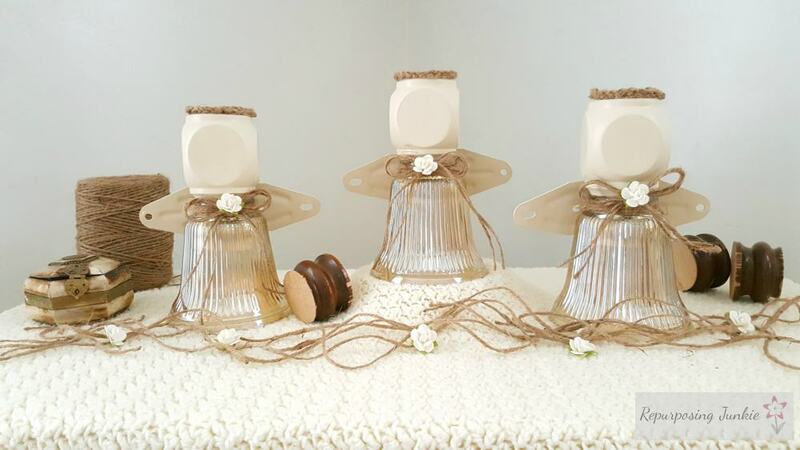 These angels were made using repurposed materials, including the glass shades that came from a ceiling fan. This fan blade is the perfect canvas for a Valentine’s Day sign. This hot air balloon was made from fan blade parts. I was able to get 3 different projects from just one fan blade to create this Christmas décor. I love how these coffee cup signs turned out. They’re the ends of fan blades. This airplane was probably one of my favorite projects using fan blades and other repurposed materials. This ladybug was made from a fan blade part and a jar lid. These cute animal planters were made using fan blade parts. A planter made from a glass shade is a great way to display flowers. Another great use for the glass shades from ceiling fans. This rustic wind chime was made using a repurposed ceiling fan part. Keri, I remember a lot of these projects, but there are so many favorites, it would be hard to nail even 1-2 down. I haven’t seen the one of the repurposed fan motor part as a mobile. Love that one! I seriously think of you every time I see a ceiling fan at the thrift store! Last time I saw one I wanted to get, it was in a trash pile and it was a rainy Sunday and didn’t want to stop. I think you are synonomous with ceiling fans to me. Thank you Florence! I can’t believe how many projects that I’ve done using the parts from ceiling fans; they’re really fun to work with.